It's Saturday afternoon two weekends ago, I woke up pretty late, it's just my brother and myself and I want chocolate. Apparently my Easter chocolate hangover finally wore off, because not only did I want chocolate, I REALLY wanted chocolate. I determined earlier in the week that I would be making a chocolate cake with perhaps a peanut butter frosting. Which, even at this moment, the mere thought is making me salivate. So what happened? I put forth a respectable effort in order to make this cake. I had all the ingredients ready to go, mixer was set, and the oven was on its way to 350. But I just couldn't get started. It was almost like I knew it was going to be a bad idea. I don't know why, but needless to say I began to question how much I wanted this cake. Now that my plan was slowly derailing, I have to admit, I became a little whiney. I whined to my brother "Do I really want to make cake?" His cheeky responses, "Cake is good" or "Do you want to make cake?" not really helping. So I whined a little bit louder so his Girlfriend, who was on the phone at the time, could hear me (yes I have no shame). Upon hearing my incesant whining my brother relayed her suggestion that I make pudding. Hmm, pudding you say? I was intrigued. I did a quick check through my bookmarks and found only one recipe for chocolate pudding. Now that had to be a good sign. I was hooked. My only problem? No good quality chocolate. Fingers crossed my brother and I looked through a few flyers to see if anyone had some on sale. Lindt 70%-99% chocolate on sale and two for five? This was definitely an omen. Braving the torrential downpour that was Saturday afternoon, my brother and I made our way to the store. Immediately after arriving home, chocolate in hand, I began the task of pudding making. The nice thing about this recipe is that compared to other puddings it's rather light, and I ended up halving it because there were only three of us (light only counts if you don't eat double the amount :)). There really is nothing complicated about making pudding, it just takes a little time, twenty minutes at the very least. It seemed to take a bit longer for me. I had the water at barely a simmer (normal temperature for double boiler when melting chocolate) which led me to increasing the temperature towards the end. It may have taken a little longer, but everything came together as it should. After a few hours in the fridge and an amazing lasagna (courtesy of my Grandmother who doesn't think we can survive on our own for a week :) ) it was time to satisfy my need for chocolate (ceasing to be a craving when I had to drive somewhere to buy chocolate). The pudding was everything I hoped it would be: rich, creamy, smooth and above all else, chocolatey. It was really good, and I'm not even a big pudding fan. My one an only alteration next time will be to try an 85% chocolate, since I thought the sweetness of the pudding could be lowered just a tad. But I always complain about that and as usual I was the only one that cared :). 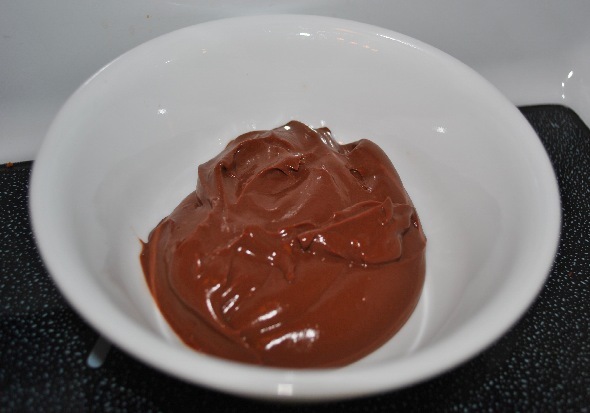 I will also say that with the current recipe it's about as sweet as your average store bought pudding, so use that as your guide for choosing your chocoalte. It's really nice to have a chocolate recipe that I can make in no time, it's exactly what I wanted and completely satiated my chocolate need. Huge kudos goes out to my brother's girlfriend for the suggestion, I would have never thought of it otherwise. So if you need chocolate, and you need chocolate now, my suggestion is to make some pudding, puddin'. 3oz 70% to 85% cocoa chocolate (85g) – my suggestion would be to not go lower than 70%, but if you like it sweeter, go for it. In a medium heat proof bowl add cornstarch, salt and sugar and whisk to combine. Slowly stir in milk and continue to stir until all dry ingredients have dissolved, scraping the bottom of the bowl as necessary. Add vanilla and whisk to combine making sure no lumps remain. Place bowl over a pot of simmering water (I had mine a little lower to start) and periodically stir mixture. After 15 to 20 minutes (mine took longer because I started with a lower temperature) the mixture should be thick enough to coat the back of a spoon – dip a spoon into mix and wipe a path with your finger. If the mix does not run, and the path stays defined you're ready. Add chocolate and stir until completely melted and combined. Place plastic wrap directly on top of the pudding and chill for at least 30 minutes – I would leave it in for a few hours, but this is preference.